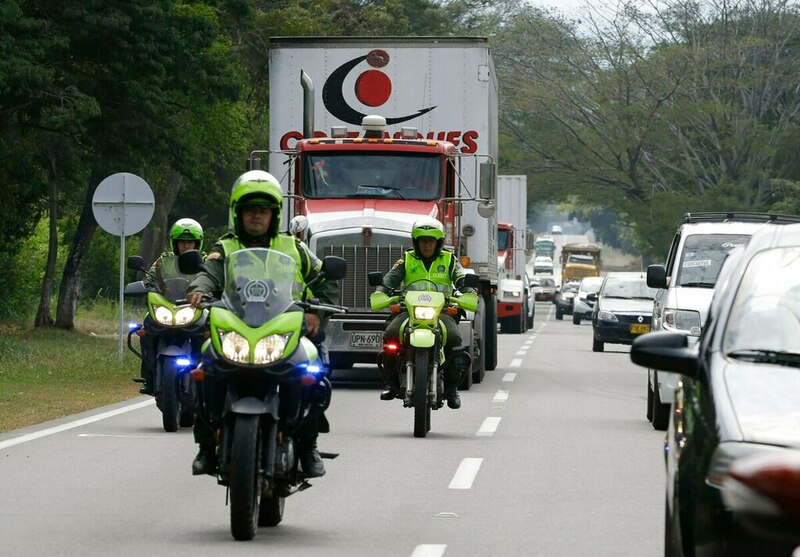 CUCUTA, Colombia — Trucks carrying U.S. humanitarian aid destined for Venezuela arrived Thursday at the Colombian border, where opposition leaders vowed to bring them into their troubled nation despite objections from embattled President Nicolas Maduro. "The United States is prepositioning relief items — including food, nutritional supplements, hygiene kits and medical supplies — in Colombia so they are available to reach those most in need in Venezuela, as soon as possible," said a U.S. official, speaking on condition of anonymity because he was not authorized to speak publicly about the issue. The focus of Venezuela's political fight now hinges on whether Maduro will allow the aid to enter the country, a move anticipated in coming days. Maduro denies a humanitarian crisis exists and says Venezuela is not a country of beggars. The Venezuelan military has barricaded a bridge between the two nations with a tanker and two cargo trailers in an apparent attempt to block the aid. 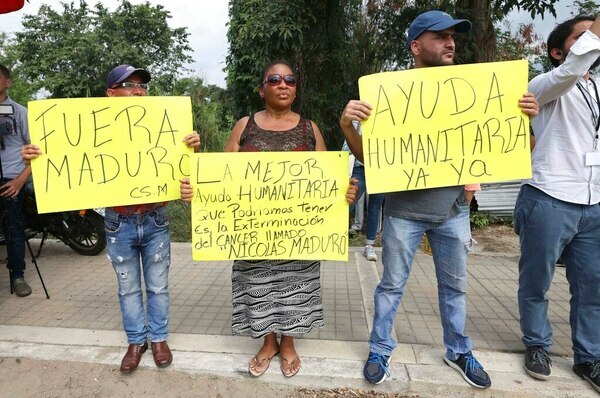 Opposition leader Juan Guaido, who requested the international assistance, said it is necessary in a country racked by shortages of basic goods. Luis Escobar, a Venezuelan who now lives in Colombia after fleeing his crisis-ridden nation, said his wife has advanced breast cancer and urged Maduro to accept the aid. In tears, he described how his wife was unable to get treatment in Venezuela and that by the time they were able to see a doctor in Colombia, her illness had significantly progressed. "I am here because, unfortunately, my wife is going to die," Escobar said. "But today I am here for Venezuelans who are suffering the same as my wife. The world has to know about this." Meanwhile, Venezuela's communications minister, Jorge Rodriguez, appeared on state TV claiming Colombian intelligence, the CIA and exiled Venezuelan opposition lawmaker Julio Borges were behind a plot to overthrow Maduro. "A murderer like Borges must set aside hypocrisy," Rodriguez said. "There's no democracy, no humanitarian aid. What will he say, now that his own accomplices gave him away?" Rodriguez showed a videotape of what he said was a confession from retired national guard Col. Oswaldo Garcia Palomo as proof of the alleged plot. An outspoken Maduro critic, Palomo has openly spoken of amassing a military force in exile to remove the Venezuelan leader from power. He was arrested last month after he entered Venezuela clandestinely from Colombia. The LCS will pick up a mission held by Oliver Hazard Perry-class frigates until 2015. Also Thursday, a coalition of European and Latin American nations called on Venezuela to hold free and transparent elections to peacefully resolve its crisis. A majority of 14 countries in the "International Contact Group" urged Venezuela to return to the rule of law and respect its constitutional institutions — starting with the democratically elected National Assembly. Spain, Italy, Portugal were among European nations signing the declaration with Uruguay, Ecuador and Costa Rica. Mexico and Bolivia participated but didn't sign. "We can have different points of view and readings about the causes of the crisis," Mogherini earlier told the gathering in the Uruguayan capital, Montevideo. "But we share the same objective, wishing to contribute to a politically peaceful and democratic solution." Haberkorn reported from Montevideo, Uruguay. Associated Press writer Scott Smith contributed from Caracas, Venezuela.